The 590-foot long MS Regatta cruise ship made a port call in Rockland Harbor in 2013. 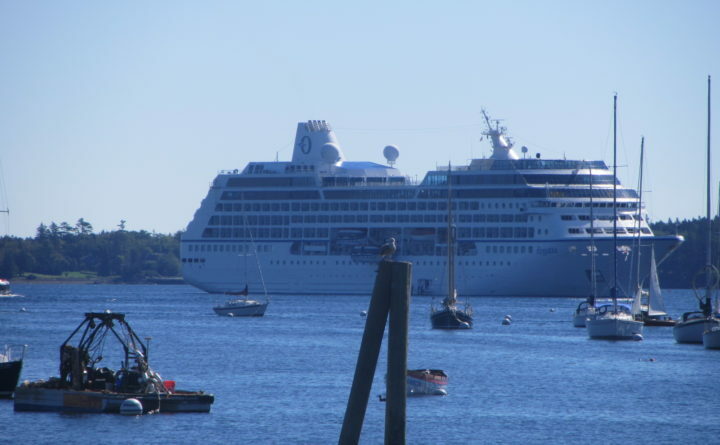 Cruise ships anchor in Rockland harbor far less often than they do in Portland, Bar Harbor or even Boothbay Harbor. But as the sight of huge passenger ships becomes more common in a harbor accustomed to much smaller fishing vessels, city leaders are grappling to cope with the impacts. Residents and councilors alike are torn on the prospect of Rockland, with a population of about 7,000, becoming a port of interest to large cruise ships. While proponents say the industry is an economic boon for the city’s mixed economy, others are concerned these floating hotels don’t align with the city’s image. “Rockland really doesn’t need massive anything in my opinion. It is a proud city but also a small town,” City Councilor Amelia Magjik said in an email. A concerted effort to attract cruise ships to Rockland has been underway for about a decade, according to former harbor master and current City Councilor Ed Glaser. Between efforts from the city and organizations such as the Penobscot Bay Region Chamber of Commerce and CruiseMaine, Rockland has been flagged for cruise lines as a destination that offers a convenient location and a vibrant coastal atmosphere. While smaller cruise operators, such as American Cruise Lines, were the first to make Rockland a regular stop — bringing fewer than 100 people into the city at a time — larger cruise ships have begun to trickle into port in recent years, bringing up to 2,000 people at a time. Harbor master Matt Ripley said that in 2016 large cruise ships made about four stops in Rockland. This year the number of stops was six, with Royal Caribbean’s Vision of the Seas making four stops, Norwegian Cruise Line’s Norwegian Gem making one stop and Silversea Cruises’ Silver Whisper making one stop. For the 2018 season, large cruise lines already have booked nine stops in Rockland, according to Ripley. One way to do that, apparently, is to deepen the revenue stream from cruise ships. Last month, the City Council approved increasing the passenger fee paid by the vessels from $8 per passenger to $10 per passenger starting in 2018. The move to increase the fee was designed to add revenue for harbor improvements to accommodate an increasing number of cruise ships, but also to claim the city’s self-worth. “There is a movement in Rockland that is gaining momentum that we own our worth and demand it forthright,” Magjik said while discussing the fee increase last month. However, when the council voted to increase the fee, the city already had contracts with several cruise lines for the 2018 and 2019 seasons set at the $8 passenger fee. The city’s attorney advised councilors that they must honor the contracts at the lower fee for the existing contracts but may charge the $10 fee on any new contracts. If Rockland were to continue to see an increase in the number of large cruise ships bringing thousands of people across the city’s waterfront, infrastructure updates are necessary, according to Ripley. When cruise ships tender passengers into the harbor, they come through the public landing. Ripley says the pier is not wide enough on days when cruise ships are in town to handle the thousands of people coming across the docks. The need to improve the public landing “comes down to a safety standpoint,” Ripley said. A portion of the passenger fee collected by the city from cruise ships is targeted at addressing these infrastructure issues. The port development fee is a part of the now $10 overall passenger fee. This money is deposited into a reserve account that allows the city to have a revenue stream for projects aimed at developing harbor infrastructure. In addition to logistical improvements on the public landing, investments in facilities such as bathrooms and in signs on the waterfront to cater to cruise ships and pleasure boaters are likely needed if the city wants to grow its standing as a port destination. Aside from generating revenue for the city, proponents of attracting more cruise ships to Rockland say the passengers being brought into Rockland provide a late-season jolt of economic activity, not just in Rockland, but in neighboring towns as well. The large cruise ships come into port during September and October, after most summer tourists have left. Ripley said the visits occur during the fall because of the cruise lines’ schedules as well as Rockland’s inability to host cruise ships during summer months when established festivals already draw thousands to the city. This year, a total of 9,728 passengers disembarked from the large cruise ships that made stops in Rockland, according to Penobscot Bay Regional Chamber of Commerce data. Of these passengers, about 2,700 participated in “on shore excursions” such as taking bus trips to Camden or visiting the Owls Head Transportation Museum. Passengers who opt out of these excursions are left to explore Rockland’s downtown. “Restaurants and shops in the downtown area are seeing double-digit percentage increases on days when cruise ships are in town,” Chamber Executive Director Tom Peaco said. As Rockland’s downtown grows with restaurants, shops, art galleries and museums, tourism is now a huge part of the local economy as well. However, with some residents voicing opposition to the expansion of cruise ship services, Ackor said more public discussion is needed before the world is welcomed to Rockland.